LONHRO (AUS) (1998). 26 wins-2 at 2, VRC Australian Cup, Gr.1. Sire of 1158 rnrs, 845 wnrs, 78 SW, inc. Pierro (ATC Golden Slipper S., Gr.1), The Conglomerate, Bounding, Mental, etc. Sire of the dams of SW Contessa Vanessa, Derryn, Gatting, Morton's Fork, Osborne Bulls, Soliloquy, Aspect, Resin, Serene Majesty, Shards, Curdled, Veranillo, Nothingilikemore, Brown Ben, SP Cloak, Cristobal, Malahat, Manicure, Marble, Bezel, Dark Universe, etc. LONHSPRESSO (f. by Lonhro). 4 wins. See below. Who Said It's Easy - Yang Jiang Hero (Mac.) (g. by Duporth). 5 wins-1 at 2-at 1100m, 1200m to 2017-18 in Aust. and Macau, 3d ATC TAB Rewards 2YO H.
Simple Affair (g. by Lonhro). 3 wins to 1200m in Aust. Simply Dreaming (f. by Denman). Placed to 2018-19 in Aust. Cottesmore (f. by Duporth). Placed at 3 in Aust. I've Got You (g. by Anabaa). Placed at 3 in Aust. MILLENNIUM DIAMOND (Royal Academy). 5 wins-3 at 2-to 1400m, R251,625, Clairwood Godolphin Barb S., Gr.3, Greyville Queen's Nursery S., L, 2d Scottsville Umsunduzi H., L, 3d Scottsville Gold Medallion S., Gr.1. Validator (Val Royal). 7 wins from 1600m to 2200m, A$226,895, SAJC Coffee Club H., MVRC Dexta Corporation H., SAJC Franklin Island H., Anthony Scopelitis Memorial H., 2d SAJC Allan Scott Park Morphettville H., VRC Princes Laundry H., SAJC 30th Schweppes Oaks Day H., 3d SAJC Port Adelaide Guineas, L, Allan Scott Park Morphettville H., Panasonic Viera H., MVRC Radio Sport 927 2YO P., 4th MRC Autumn Classic, Gr.2. Ramstadius. 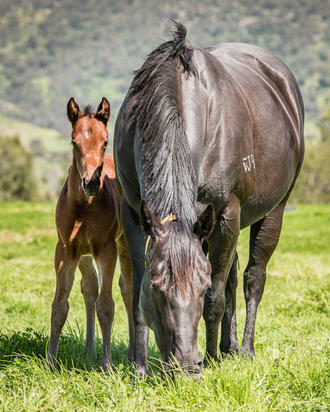 8 wins to 1300m, A$96,260, BTC Excimer Laser Vision Centre H., Moraitis Flying H., Clayton Utz H., QTC Kedron-Wavell Services Club H., 2d QTC Zillman 2YO H., Innisfree H., Earlwood H., 3d QTC Mitty's World of Sport H., Year 12 Parents Race H.
Red Hot Pepper. 4 wins-1 at 2-from 1200m to 1600m, A$141,350, AJC National Telecoms Cup H., Time Magazine H., Dual Quest 2YO H., 2d STC Hyland Race Colours Welter H., 3d STC Bride to Be H., 4th STC Todman Slipper Trial S., Gr.2. Hemingway. 4 wins-1 at 2-to 1250m, AJC Diggers Bar & Grill 2YO H., STC Manly Warringah Masonic Club H., 2d Townsville TC Cannon Park Cleveland Bay H., AJC Rose of Tralee H., 3d AJC Colonial Funerals H., STC Ingham Love'em H., Club Hotel H.
Kanchanaburi. 5 wins from 1400m to 2100m, A$76,439, TRC Betfair.com H., Marsh Insurance Brokers H., Twentieth Century Plumbing P., TTC Shaw Contracting H., 2d TRC Australia Post H., Thorpe Transport H., Business East P., Gateway Sorell H., TTC Happy Birthday Peg H., Catholic Development Fund H., Life Members H., 3d TRC Raine & Horne Spring Series H.
RIVER DON (Nisku). 13 wins-2 at 2-from 900m to 1700m, A$97,880, TRC Crown Lager S., L, 3d TRC Elwick S., Gr.3. DUPORTH (Red Ransom). Joint top of 2008-09 Australasian 3YO Classification (sprint). 3 wins to 1400m, A$1,147,875, BTC Cup, Gr.1. Sire. EXCITES (Danewin). Winner at 2, A$528,050, AJC Sires' Produce S., Gr.1. Sire. TICKETS (Redoute's Choice). 4 wins-2 at 2-to 1500m, A$579,100, STC Pago Pago S., Gr.2, 2d AJC Sires Produce S., Gr.1. Sire. DELAGO DELUXE (Encosta de Lago). Champion 2YO Colt in South Africa in 2010-11. 7 wins-4 at 2-to 1200m, R1,498,525, Scottsville Gold Medallion S., Gr.1. Sire. DASHING IMAGE (Success Express). 8 wins-1 at 2-to 1400m, A$244,600, GCTC Goldmarket H., L, 2d QTC Sir Edward Williams H., L.
Special Effects (Salieri). 4 wins to 1400m, A$93,440, Qld Tatt's RC LS Holdway H., 2d GCTC Goldmarket H., L. Sire. TIYATROLANI (Captain Sonador). 4 wins-2 at 2-to 1100m, A$319,625, BRC Mick Dittman P., L, 3d BRC Chief de Beers H., L.
CALIENTE (Sequalo). 2 wins-1 at 2-at 1000m, 1200m, A$137,500, BRC Mode P., L, 2d Qld Tatt's RC Mercedes-Benz S., L.
Tetsu Gama (Invincible Spirit). 3 wins to 1200m, A$85,867, MRC Betfair H., 2d Mornington RC Hareeba S., L.
4 wins at 1200m, A$324,775, SAJC Centrebet Classic, Gr.2, VRC Straight Six H., L, MRC Land Engineering H., 2d Swan Hill JC Golden Topaz, 3d MRC Alinghi S., L.
2016 f. by Fastnet Rock. 2017 f. by I Am Invincible. Served by American Pharoah. Date of last service, 25.11.2017.